How does accountability work for you, as a writer? Because at the end of the day, whether you’re Jack Driscoll or Jane Doe, at some point in time, you have to actually finish something. And no matter if you’re making your living full-time as a writer or eeking out a few minutes here and there between a career in a different field, you still have some sort of motivation that urges you forward, to the next page, the next chapter, the final resolution. In short: No writer starts a story, hoping that it will never end. The answers I’ve been getting are as varied as the stories we’re all writing. Some writers have “text buddies” they check in with daily, sharing word counts or revision goals. Others use apps or online organizers such as Submittable to nudge themselves toward contest deadlines or themed calls for submission. Many attend conferences or workshops that require writing samples or assignments, because a hard deadline will guarantee a completed draft. Still others will enroll in online classes or receive prompts by e-mail, to assure they stay engaged with their creative sides and start new work inspired by new craft tools or community experiences. All of this motivated me to imagine an innovative, online community for writers that offers sustainable accountability with a low price point. The program is called Airstream Dispatches and it offers a low-pressure, supportive environment for writers with prompts, readings, and instructor access…without a huge time commitment. To get started, I’m offering a free resource guide and craft lesson right here. It’s my belief that accountability for writers doesn’t have to be about harsh, rigid deadlines or word counts. It doesn’t have to be about bullying yourself into writing. Writing is hard enough. Enjoyable, yes, but also—let’s be honest—hard work. So many writers I mentor make it harder for themselves by acting as their own biggest bullies. But bullying doesn’t help in any sustainable way. On the other hand, gentle accountability for writers is about having a supportive, generous community you can check in with. It’s about getting grounded, talking craft, generating new work, and connecting. And guess what? I’ve tested this approach with myself and writers across the globe. It works. Desiring rewards/acknowledgement is a natural facet of human behavior. “Neuroscientists have known for years that dopamine is linked to positive behavior reinforcement and the ‘ding, ding, ding’ jackpot feeling you get when you accomplish a goal. Recently they have also discovered the specific receptors that link dopamine directly to the formation of good and bad habits” (Psychology Today Online). Some of the things writers struggle with (deadlines, submissions, writing to achieve a goal) can shift towards a good habit when writers have accountability, either one-on-one or within a larger community. “Dopamine is the fuel that keeps people motivated to persevere and achieve a goal. You have the power to increase your production of dopamine by changing your attitude and behavior”(Psychology Today Online). In a group setting like Airstream Dispatches, we’re bolstered and encouraged to make small changes to our writerly behaviors that ultimately impact goal achievement and boost our dopamine, which continues the positive reinforcement loop. Supporting each other as writers and creating accountability experiences all adds up to more writing goals met. 2. Accountability makes us visible. All the invisible stories and stuff we tell ourselves that limit or get in the way of reaching our goals becomes visible with accountability. The stuff we dream up in our heads, the drafts our friends never see, the character sketches and doubts and wonderings—all become visible when we gather with the spirit of support and growth. That’s one major reason I provide writing prompts with optional sharing/deadlines, via Airstream Dispatches. I’ve found that this gentle nudge to move forward and past the invisible stories in a writer’s head helps motivate us to show up and share what we’ve been working on. Even the most introverted or hermit writer still wants to feel “seen” or “understood.” The accountability in Airstream Dispatches gives writers a chance to show up and check-in; it gives writers a chance to exercise their skills as readers (thereby working on their work without actually working on it, in other words, learning through the work of others, instead of continuing to stare at their own pages). Accountability, in this curated experience, will enliven and inspire, deepening your creative practice. If you’re ready for a new type of accountability, Airstream Dispatches is the right place for you. It’s a chance for us to gather in this spirit to do meaningful creative work. This worldwide book club for writers brings together a group of dedicated creatives who want the same thing I do: new knowledge, fun, productivity, and connection—no strings attached. Is this you? Will you show up for yourself and your imagination, just once a month? 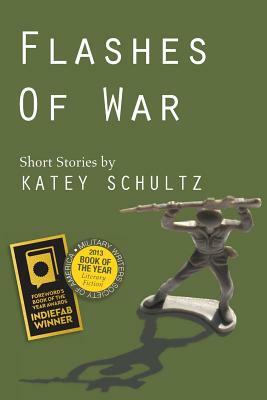 Katey Schultz’ story collection, Flashes of War, was awarded IndieFab Book of the Year and received a Gold Medal from the Military Writers Society of America. She has won more than half a dozen flash fiction contests, been awarded writing fellowships in eight states, and is currently seeking a publisher for her novel set in Afghanistan. Her newest online program, Airstream Dispatches: a worldwide book club for writers, brings together a group of dedicated creatives who want accountability, craft-based instructional writing prompts, and the community of other writers to feel supported and “seen.” Explore her online classes, ecourses, and writing at www.kateyschultz.com. This was written by charles. Posted on Tuesday, July 24, 2018, at 10:48 am. Filed under Uncategorized. Tagged airstream dispatches, flashes of war, jack driscoll, katey schultz. Bookmark the permalink. Follow comments here with the RSS feed. Both comments and trackbacks are currently closed.